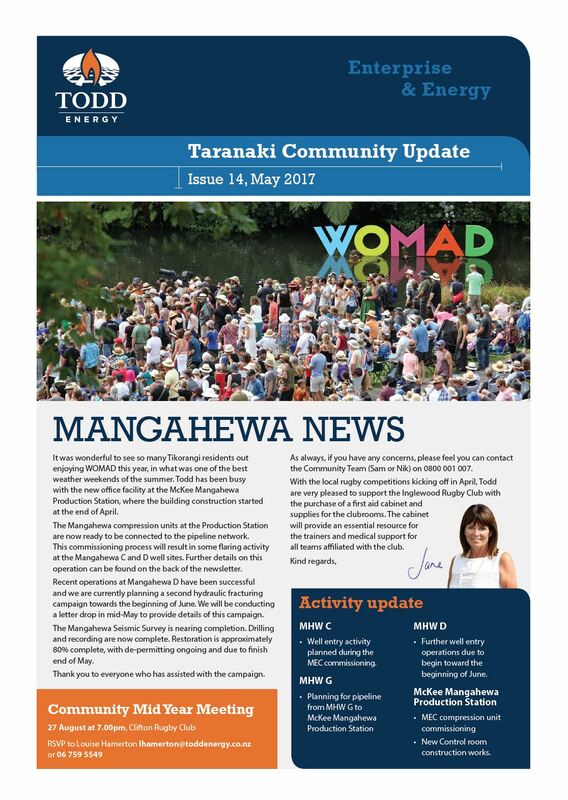 It was wonderful to see so many Tikorangi residents out enjoying WOMAD this year, in what was one of the best weather weekends of the summer. Todd has been busy with the new office facility at the McKee Mangahewa Production Station, where the building construction started at the end of April. The Mangahewa compression units at the Production Station are now ready to be connected to the pipeline network. This commissioning process will result in some flaring activity at the Mangahewa C and D well sites. Further details on this operation can be found on the back of the newsletter. Recent operations at Mangahewa D have been successful and we are currently planning a second hydraulic fracturing campaign towards the beginning of June. We will be conducting a letter drop in mid-May to provide details of this campaign. The Mangahewa Seismic Survey is nearing completion. Drilling and recording are now complete. Restoration is approximately 80% complete, with de-permitting ongoing and due to finish end of May. Thank you to everyone who has assisted with the campaign. As always, if you have any concerns, please feel you can contact the Community Team (Sam or Nik) on 0800 001 007. With the local rugby competitions kicking off in April, Todd are very pleased to support the Inglewood Rugby Club with the purchase of a first aid cabinet and supplies for the clubrooms. The cabinet will provide an essential resource for the trainers and medical support for all teams affiliated with the club.